The year 1886 was a banner year for Isabella. In that year she had six books published, including Spun from Fact and One Commonplace Day. 1886 was a banner year for America, too. A wave of patriotism was surging through the country, thanks to the long-awaited unveiling of the Statue of Liberty on a small island in New York’s harbor. 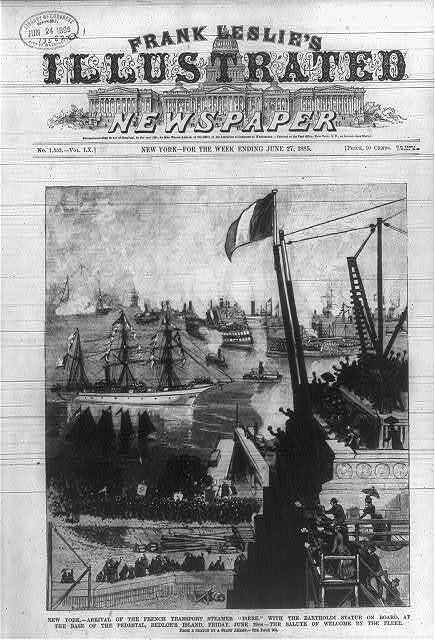 Frank Leslie’s Illustrated Newspaper for June 27, 1885, chronicling the New York arrival of the French transport steamer, Isere, with the Statue of Liberty on board. Newspapers and magazines were full of descriptions of the statue and of the pedestal that was being constructed for it on Bedloe Island in New York harbor. Americans were intrigued by the sheer size of the statue. They marveled over its engineering and wondered how the torch would remain lit. 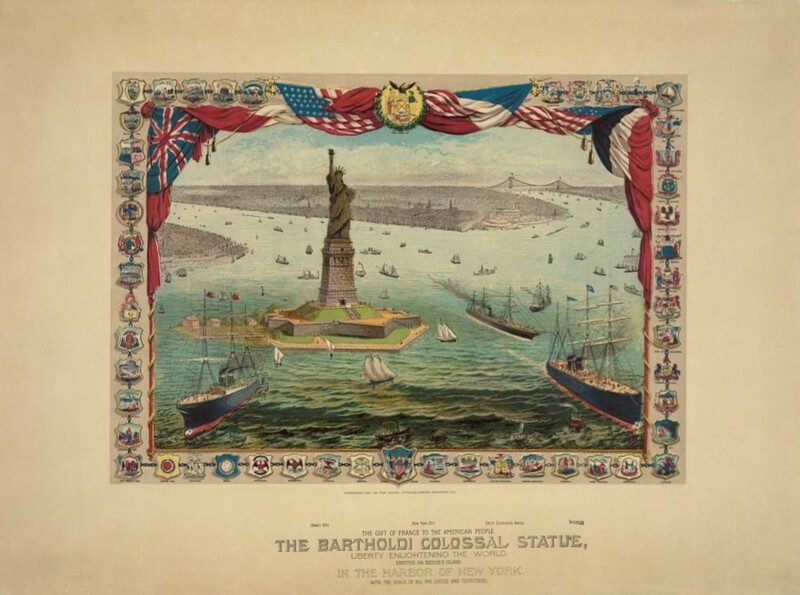 An 1884 print illustrating the proposed location of the Statue of Liberty in New York harbor. The statue was the brainchild of French sculptor Frederic Auguste Bartholdi. He originally envisioned presenting the statue to the United States on the one-hundred year anniversary of the signing of America’s Declaration of Independence, but he did not have enough of the statue completed by that deadline. 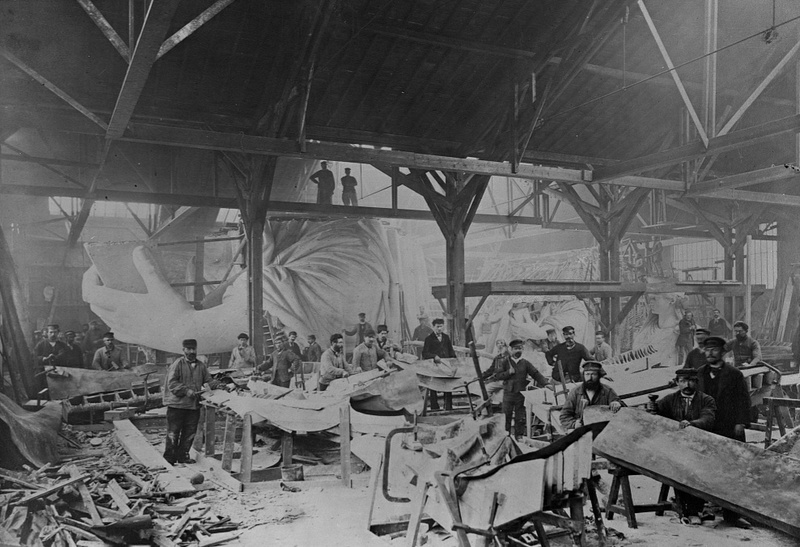 An 1882 photo of workmen constructing the Statue of Liberty in Bartholdi’s Paris warehouse. Instead, he sent America pieces of the statue. For example, in 1876 he sent to America the hand holding the torch and one of the feet of the Statue of Liberty. Those pieces toured American cities as part of the centennial celebration, and helped raise the funds needed to erect the pedestal on which the Statue of Liberty would ultimately stand. 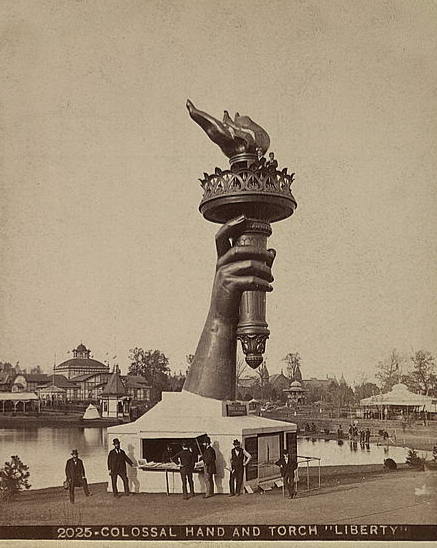 The torch and part of the arm of the Statue of Liberty on display at the 1876 Centennial Exhibition in Philadelphia. Ten years later, the pedestal was in place. Bertholdi was finally able to assemble the statue on top, and America set the date for the unveiling for October 28, 1886. That day dawned cold and misty. A light fog hung over the city; it had rained the day before, so areas that were not paved were muddy. But wet pavement and mud and chilly temperatures couldn’t dampen America’s enthusiasm. Everywhere the city was decorated with buntings and flags. French flags flew from the tops of American households, and American flags fluttered from almost every window. People came from all over the country to fill the New York streets. Businesses shut down and public schools closed as all New York joined in the celebration. The festivities began with a parade. 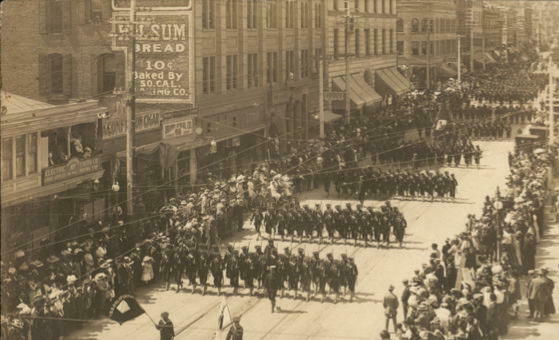 Newspaper accounts estimated between 25,000 and 30,000 men paraded through the city. It took over two hours for the head of the parade to reach the Battery. 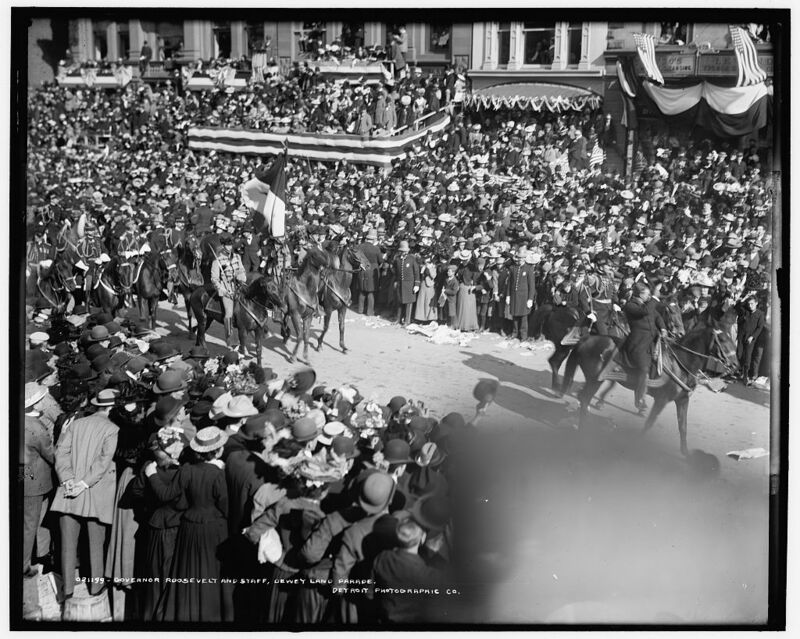 A New York Parade, about 1910. Volunteer firemen’s associations, Knights of Pythias, federal judges, local mayors, and veterans of 1812 joined the ranks of marchers. 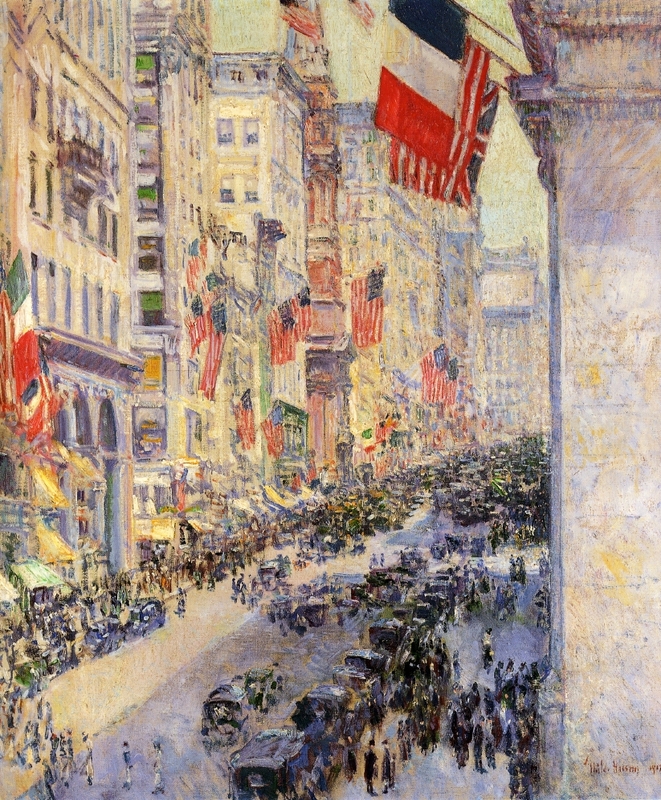 They paraded down Fifth Avenue, past Central Park to Madison Square, then on to the review stands on Twenty-Fourth Street. 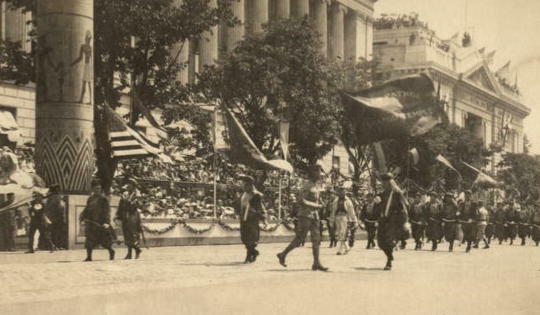 Undated photo of the Masons of Pyramid Temple on parade. When President Cleveland stepped up on the stand, the crowd cheered; but then the people close enough to the stage caught sight of the sculptor, Monsieur Bartholdi, who was waiting to be introduced. The crowd instantly recognized him because his likeness appeared on the programmes and in illustrated newspapers. 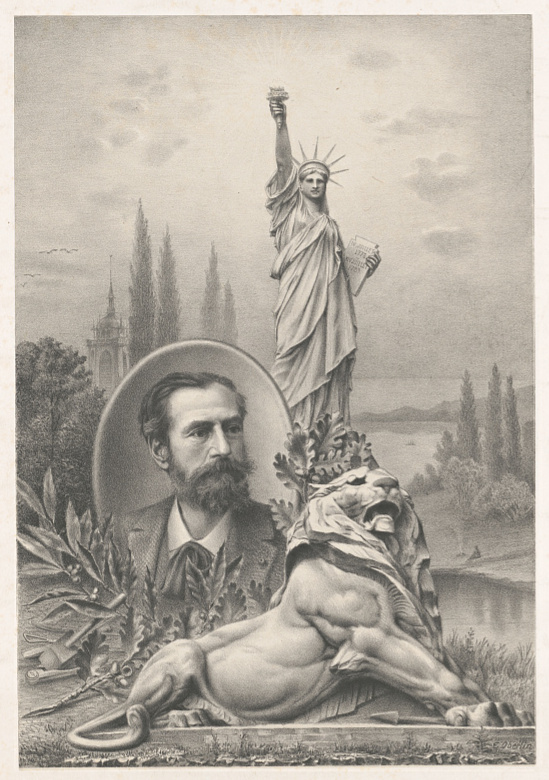 A promotional image of French sculptor Frederic Auguste Bartholdi, with the Statue of Liberty and a sculpture of a lion. Those nearest the stand began to chant his name, “Bartholdi, Bartholdi.” Crowds on the avenue up and down heard the name and passed it to the people in the park, and they passed it to the people on the side streets, until the air was “shaken with the roar of cheering” the sculptor’s name. Monsieur Bartholdi accompanied President Cleveland aboard the steamship Dispatch, to make the short journey across the bay to Bedloe Island. As soon as the Dispatch got under way, over 100 vessels, decorated with flags and bunting, blasted their whistles and followed behind. 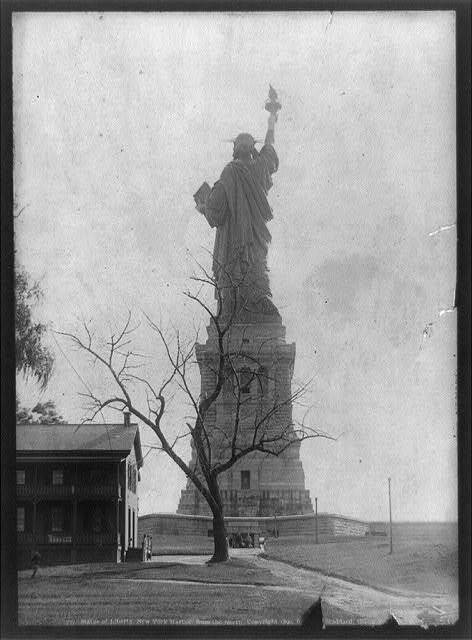 Undated photo of the Statue of Liberty in New York Harbor, viewed from the north. When they reached Bedloe Island the official unveiling ceremony took place. A large French flag had been placed over the head of the statue, but at the signal, the flag was pulled away, to the sound of a salute of gun fire by all the batteries in the harbor, afloat and ashore. 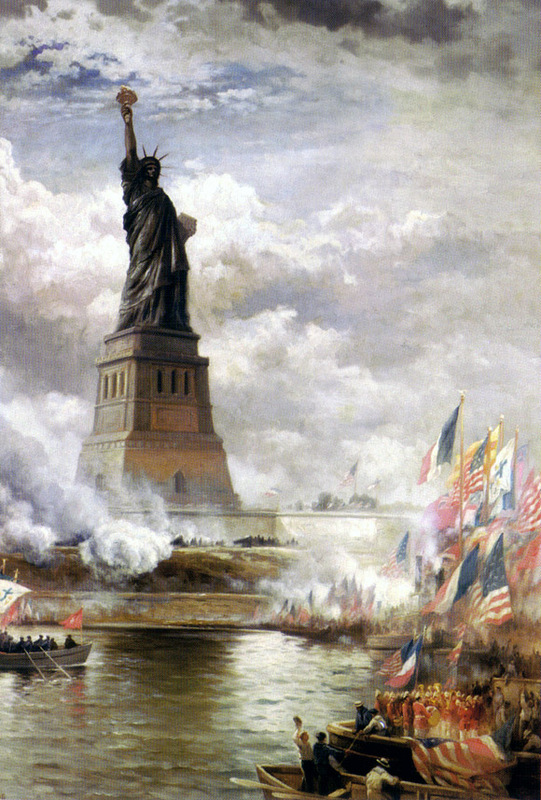 “Unveiling the Statue of Liberty,” by Edward Percy Moran, 1886. President Cleveland formally accepted the statue on behalf of the United States, after which there followed an address by a representative of France, then music, and a benediction. When the ceremony concluded there was a one-hundred-gun salute, and the steamers in the bay blew their whistles. The guns on Governor’s Island and other forts fired for a full half an hour. By this time the rain had begun to fall, but the crowds did not disperse. Over a million people filled every available space from Wall Street to Pearl Street and to the Battery. They stood in the drenching rain and driving winds and cheered themselves hoarse. 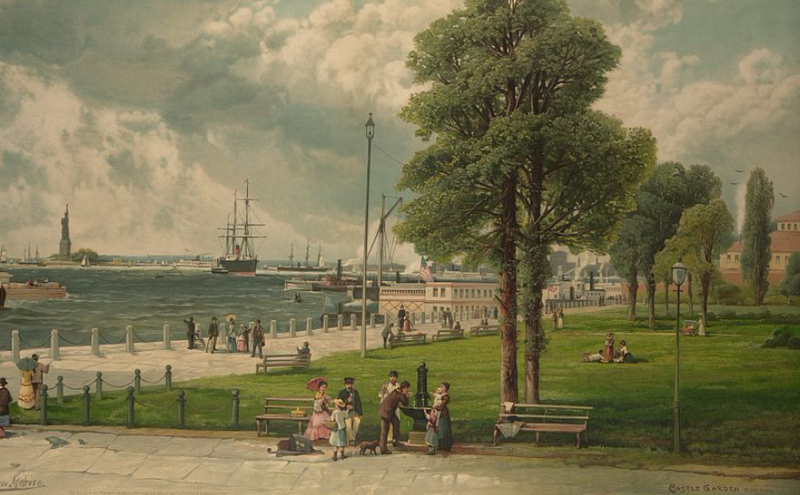 A view of the “Statue of Liberty from Castle Garden,” New York, by Andrew Melrose, 1887. That rainy October day in 1886 was a great day for the city of New York and for the American people, who received a gift that would go on to epitomize the spirit of liberty and refuge for people all over the world. This video provides more detail about the Statue of Liberty and how it came to reside on Bedloe Island. Click here to read Isabella’s book Spun from Fact, published in 1886. And click here for more information about Isabella’s 1886 novel, One Commonplace Day. Totally WONDERFUL post. I love these glimpses into Isabella’s world. Thank you–and thank you SO MUCH for Spun from Fact! Can’t wait to read it. God bless your work!